Klout, the social media tool that rates a user’s influence across their social network accounts, now has the option to factor in a YouTube profile into its scoring system. Last month, Klout introduced Foursquare support, in addition to Twitter, Facebook, and LinkedIn, into its score calculation. Once a user has synced their YouTube profile with the service, Klout analyzes the activity of a user’s profile and videos. Specifically, for example, it looks at the number of views, subscribers, likes, and comments. To determine a Klout score, the service analyzes action characteristics across all of a user’s connected social media accounts in an algorithm of over 35 variables. Klout assumes influence is correlated with the amount of action a profile sees. So, the more clicks, likes, retweets, wallposts, and other actions a user receives, the more influential the user is. Scores can rank from 1 to 100, and only one user can have a perfect score at a time. The current title-holder is none other than Justin Bieber. By the end of the year, Klout hopes to be able to factor in over twenty different social network platforms into a user’s score. Tumblr, currently the blogging platform with the greatest number of users, and Google+ are two networks set in Klout’s sites. Google+, however, requires the release of an application programming interface (API) from Google in order to allow Klout to communicate with the software. Not everyone takes interest in their Klout score. But, small businesses and brands are using its services more and more to learn how they can effectively alter their social network usage to achieve greater results for their business. Not only does Klout calculate an overall score, but the service provides users with other grades on the quality of their content, the probability that content receives action, and audience size as well. Depending on their scores, users can determine if they should release higher quality content, release content on a steadier basis, or engage with a wider audience. The company is also working on Klout Perks, a new service to reward users who are influential on certain topics with free products. For example, if someone is deemed influential on the topic of movies and film, Klout Perks assumes that their friends and followers turn to them to hear their opinion. So, by providing related products to key influencers, brands can help generate buzz and cheap promotion. In the near future, expect Klout to announce further support of social networks in its influence equation and the expansion of Klout Perks. 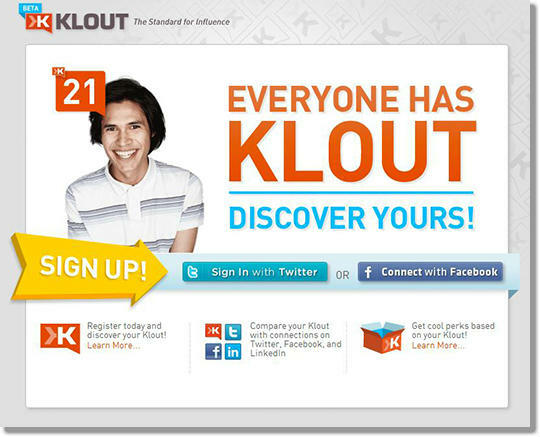 What’s your Klout score and what do you think of the service?